On the 8th October 2018 the Connect Fund held its first Learning Community Event. 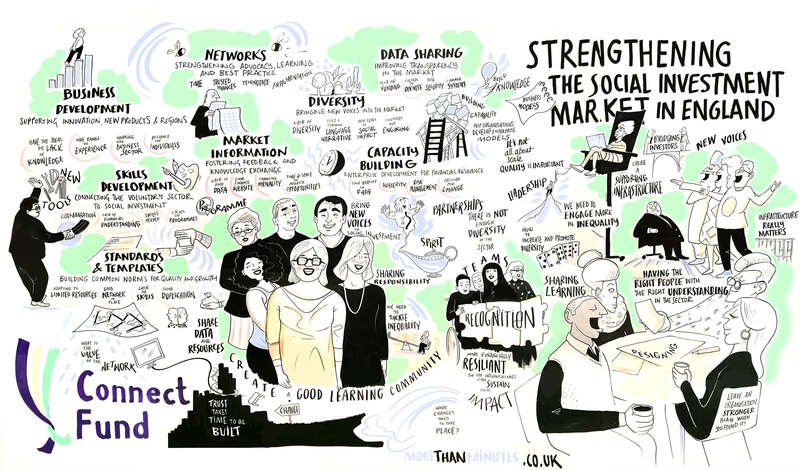 Grantees had an opportunity to meet each other face-to-face, learn more about each others projects and how they can work collaboratively, through the Connect Fund, to make the social investment market in England better meet the needs of charities and social enterprises. Reactions to the day have been very positive. Of those who responded to our feedback survey*, everyone found some or most of the discussions useful or beneficial to their project and 97%* felt their understand of the Connect Fund and its projects had improved. Sessions on diversity in social investment, how to avoid duplication of tools and resources, and gaps in the market will inform our strategy on how we distribute further funding. 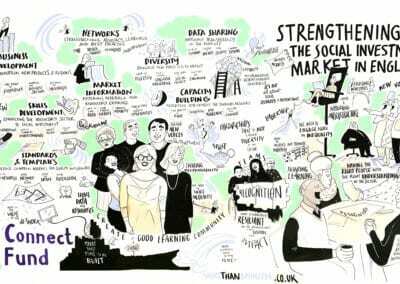 You can see the visual minutes of the day, skilfully taken by More Than Minutes, below. *37 participants out of a total of 49 grantee attendees responded to the Learning Community Event feedback survey.